I've been on a sock adventure lately and I've so enjoyed sharpening my knitting skills and learning new ways to do things. The thrill of watching a new technique come to life never wanes and it's extremely satisfying to start something without a clue, re-do it half a dozen times to get it just right and then revel in mastering it. If you haven't tried something new lately, you should. I promise you'll have fun and personally, I think socks are a good place to start. See my yarn? Isn't it pretty? It's a hand-dyed alpaca/merino/nylon blend by the very friendly indie dyer Happy-go-knitty here in Auckland, New Zealand. She does a fabulous range of vivid, cheerful colourways on several bases and her yarn is in hot demand. 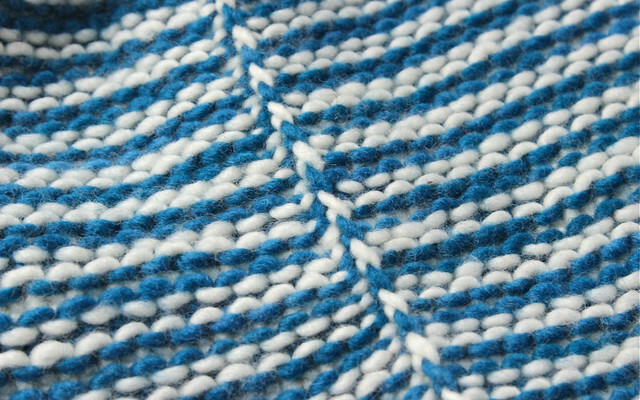 This blend is stunningly soft (it's 60% alpaca and 20% merino) and seems to be hardwearing which surprised me given it's composition. I re-knitted my first toe no less than four times and you would never guess, the yarn looks pristine. 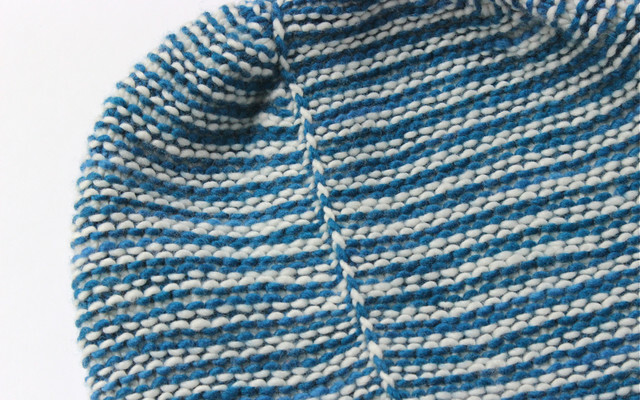 I may be the last person to try self-striping yarn, but better late than never I guess. 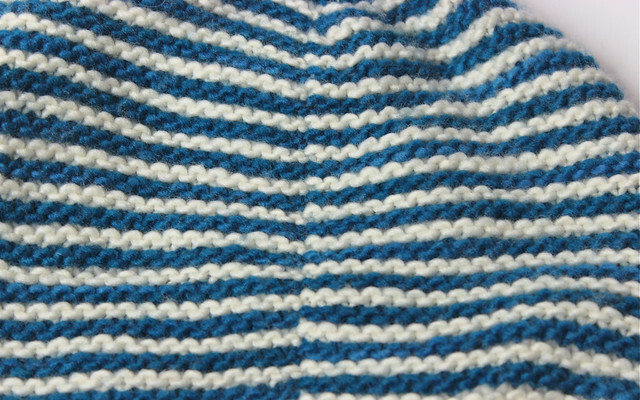 I can confirm that stripes are as cool to knit as they say. The colours appear magically and it's quite addictive knitting band after band. These certainly won't be my last self-striping socks either - I'm quite a fan of stripes and I'm sure I'm in need of a few more pairs. But, there's more to these socks than trying new yarn. 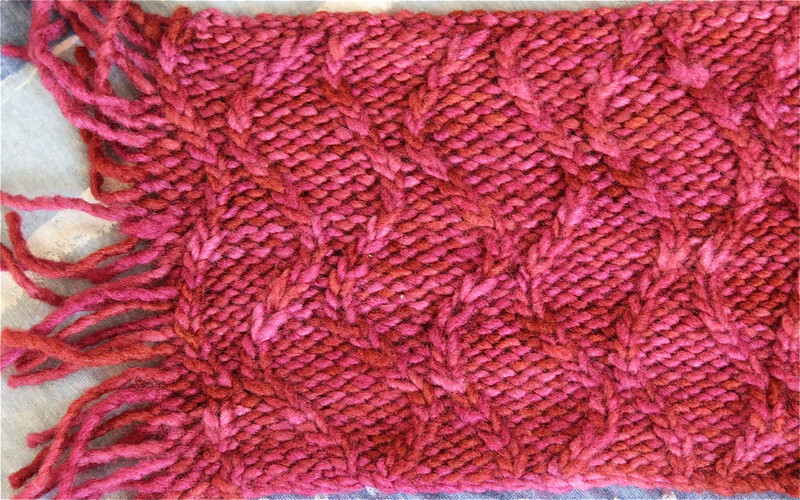 I'm also using new-to-me techniques like starting at the toe instead of the cuff and a fancy short row heel. Fun huh?! I found my toe cast on in Cap Sease's book Cast On, Bind Off, 211 Ways to Begin and End Your Knitting. She's got a bunch of sock cast ons for cuffs and toes and I used the Straight Wrap Cast On aka Turkish Cast On. I have actually used this cast on before - but on a larger scale for the fab knitted bag I made last year. Anyhow, this time I started with 24 teeny stitches and away I went. I'd love to say it was a breeze, but it was really fiddly. The end result was good but I was nervous I'd snap my needles over those first few rows and felt a little cross with the whole thing. It probably didn't help that I started the first sock so many times, to tweak the number of stitches I was increasing, to perfect the look of the increases and to change needle sizes. 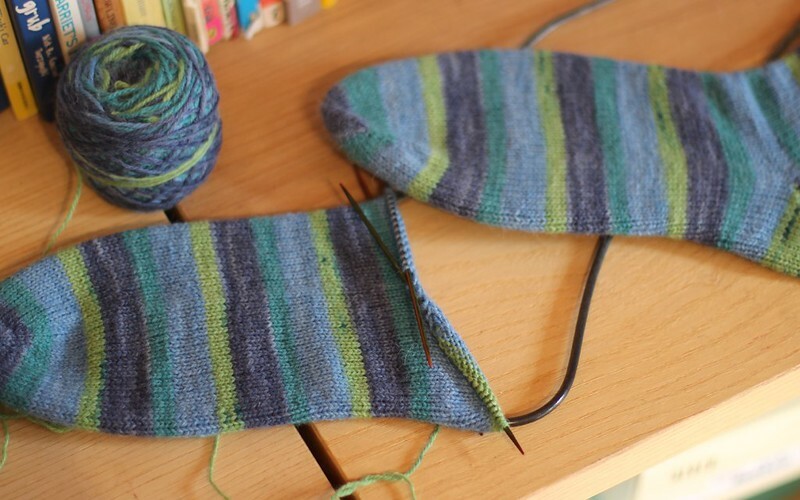 It was so much of a chore that when I cast on sock number 2 and then realised that I had left too much of the darker blue for the first stripe and the two socks wouldn't exactly match - I took the uncharacteristic route of deciding I didn't care and kept knitting anyway. Next time I think I'll avoid casting on with my dpns. I'm planning to get myself a teeny weeny circular needle tip and knit my toes with that. I have a feeling it'll be a more pleasurable experience. I thought the heel would be interesting and I was keen to try the short row Fish Lips Kiss Heel after all the hype I've heard about it. Now I've done one (and a half) heels I'm pleased to say, it lives up to the hype. 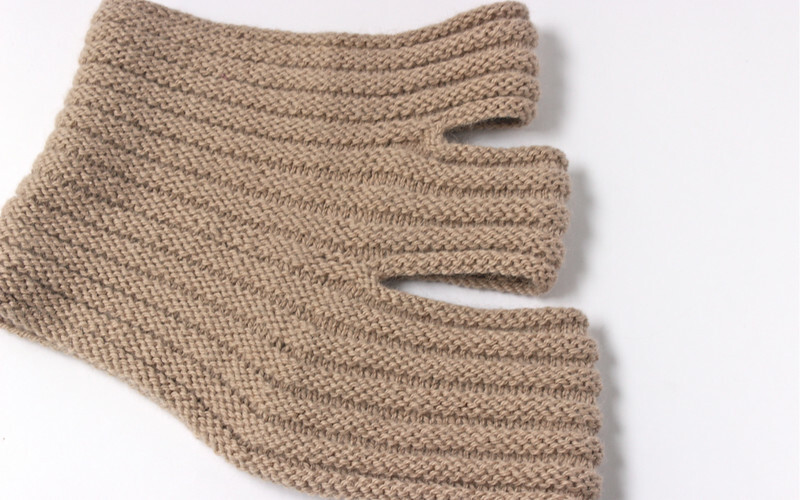 I found it fun and easy to knit and it's both comfy and a good fit on my foot. 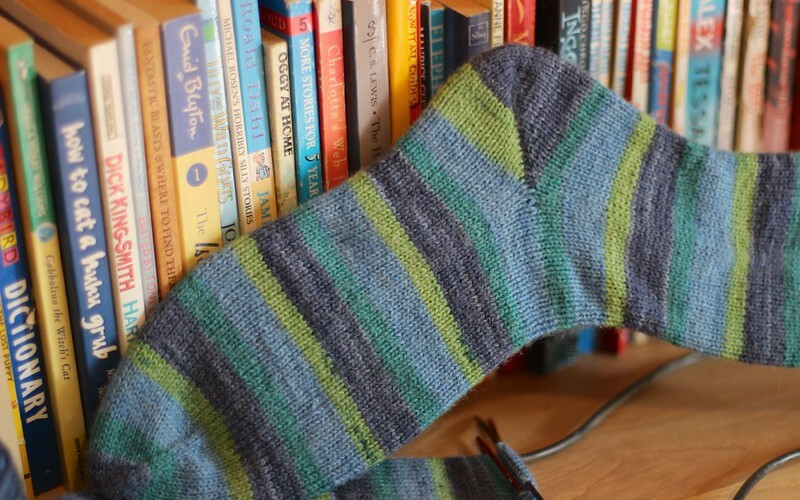 The instructions are great, including photos to describe some of the stitches and there is a ton of information on how to knit a sock for any sized foot from the top down or the bottom up. It's a cheap little pattern at US$1 and I think worth it's weight in gold if you're keen to try a short row heel that'll give you a nice fit. Do you like my sock blockers? They are fat wire with a hook at the top and look quite old. Happily, I found them in a cupboard in our new house. My theory is that the farmer who lived here stretched his socks over them at the end of the day and hung them over a heater (still in the cupboard) to either dry out or warm up for the next morning - or maybe both. I wonder if he'd be a little surprised at how I'm using them? You can find more details about my socks, including stitch counts and needle sizes, on my Ravelry project page. Stay tuned. I've got a giveaway coming up over the weekend! Truly Grace - We're off! 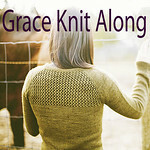 Have you cast on your Grace cardigan? I have :) After wrapping up my Flowing Lines sweater in the wee hours of Thursday evening, I cast on my Grace on Friday, the 1st of March. So far, sort of so good. Once again I fall between sizes and that leads to a dilemma about which size to choose and then the nervousness about whether I picked the right one. I like the fit of my Audrey cardigan, so I measured it and have opted for the smaller of the two Grace sizes in question. I'm counting on relaxing into the knit and my gauge "relaxing" with me. Hopefully that'll ensure it turns out slightly bigger ... fingers crossed. As of today, I've done all my raglan increases and am making my way down to the bottom of the yoke. With a bit of luck I'll finish that and divide for the body and sleeves tonight. The lace adds interest, but after my initial boo boo I'm double checking myself all the time, not going terribly quickly, and am quite looking forward to getting onto the stockinette sections! 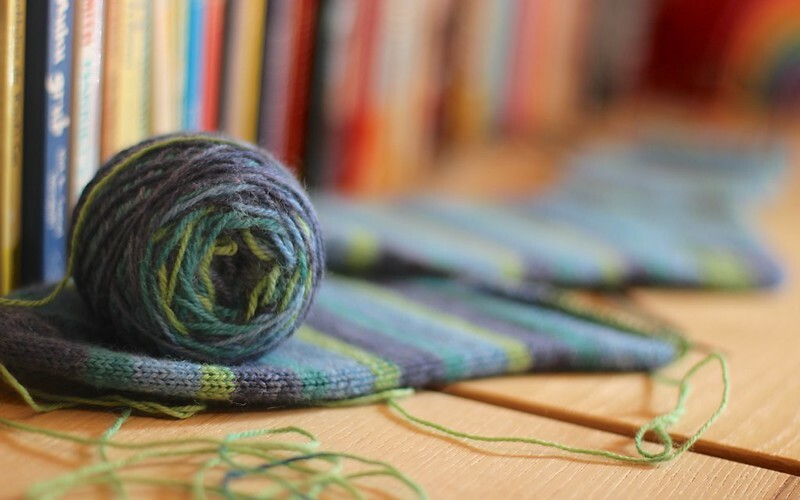 M1L: lift the bar between the stitch you've just knit and the next stitch from front to back (you guessed it, left-handers aren't back to front...) and then knit into the front leg so it twists. 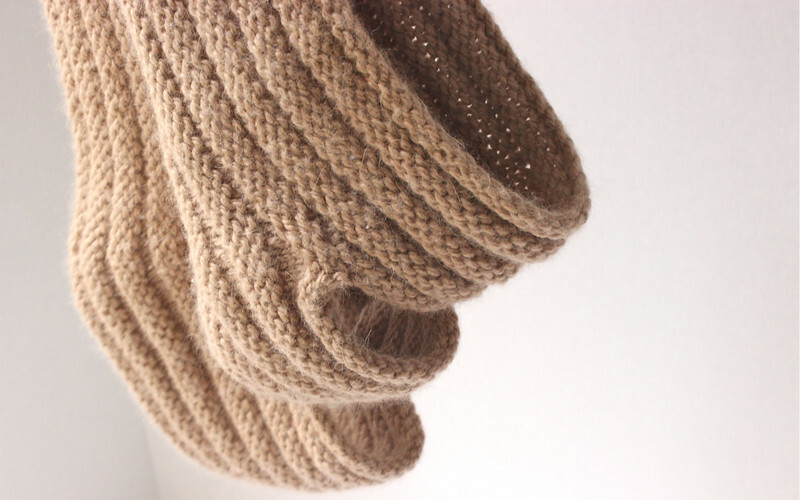 I've made a page telling you all the information about the knit along here. There's also a link at the top of the page. If you've got a blog and would like to grab a button for your side bar you're welcome to use this one. Let me know if you'd like me to set up a blog linky under my Grace posts too. It's still cold here, so Outfit 2 needs a hat. 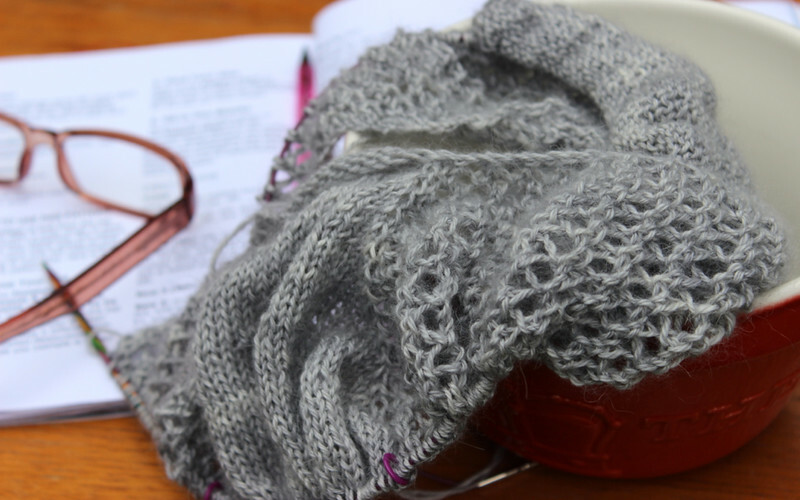 I've knitted Veera's Here & There togue before, as a gift and have been hankering after my own ever since. Veera designed it for the Malabrigo freelance pattern project, so it's intended to be knit in Malabrigo and I've unwittingly used similar colours to hers. 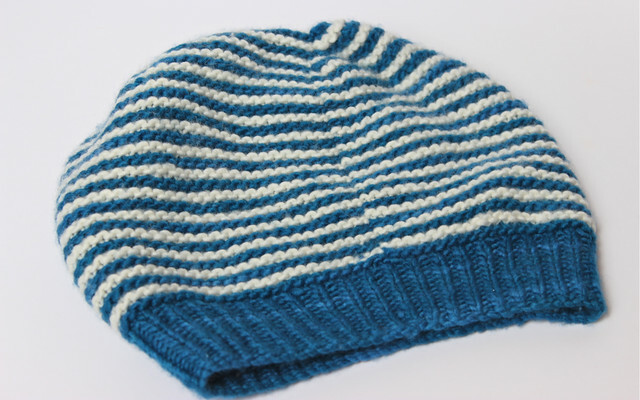 The Prussian Blue is the Pagoda colourway and the white is Natural. I just love the ebb and flow of colour, you can see it clearly in the band. Like my first version of this hat, I've decided to include the faux seam at the back instead of hiding it behind the cable like others have. I rather like the seam. This is how it looks on the outside. At the end of each row I twist my yarns at the back and give them a little tug to tighten. There's a slight jog, but actually it's pretty neat and tidy. Here's the wrong side. 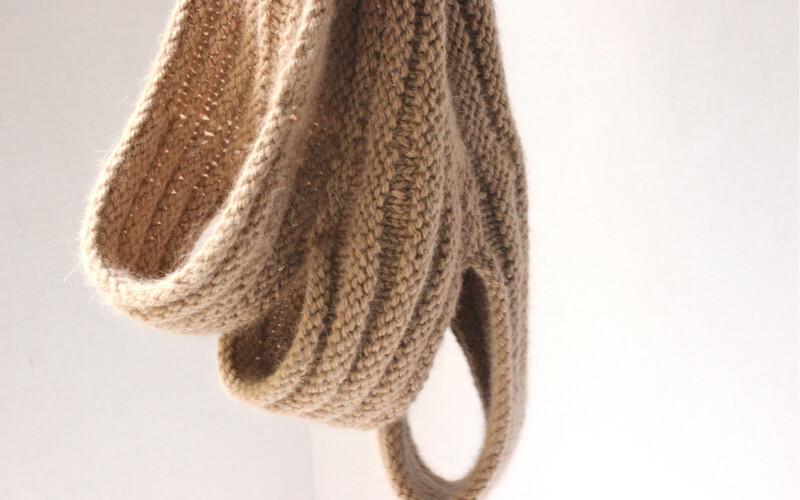 The twisted yarns form a neat line on the underside. No straggly bits or unsightly mess. And it's not hard to do, just twist and tug. 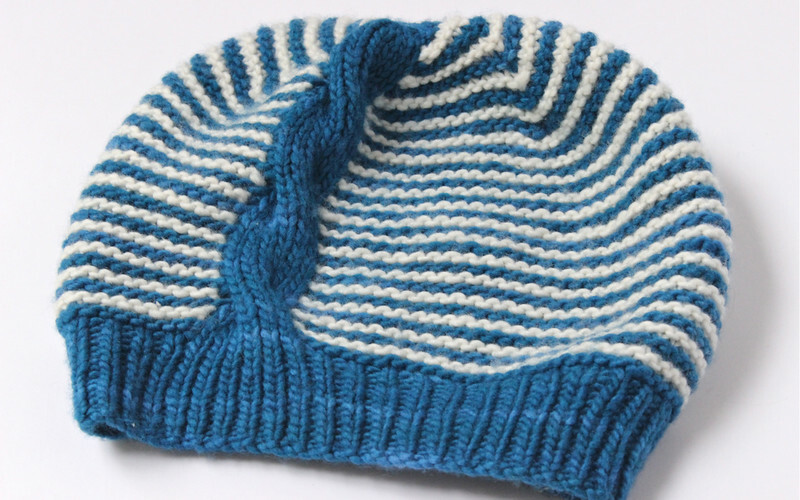 You can find my hat on Ravelry here.